Frank Joseph James “Budd” Lynch was a public address announcer, best known for announcing games for the Detroit Red Wings at Joe Louis Arena. Lynch was born in Windsor, Ontario on August 7, 1917. Lynch began his broadcasting career in 1936, joining the radio station CHML in Hamilton, Ontario. In 1939, Lynch joined the Essex Scottish Regiment of the Canadian Army in World War II. In 1944, he lost his right arm during combat. After returning from overseas, Lynch resumed his radio career as the play-by-play voice of the Windsor Spitfires on CKLW. He began announcing for the Detroit Red Wings in 1949 after the team’s general manager, Jack Adams, invited Lynch to call games for his organization. Lynch became the team’s radio voice from 1960 through 1975. He served as the team’s Director of Publicity from 1975 through 1985, when after an attempt at retirement he accepted to stay on as a public address announcer. Lynch was the recipient of many honours for his announcing work, including the 1985 Foster Hewitt Memorial Award, a 1994 induction into the Michigan Sports Hall of Fame, and the 2005 Ty Tyson Excellence in Sports Broadcasting Award. Lynch lived in Wyandotte, Michigan, until his death on October 9, 2012. He was 95 years old. “Budd Lynch dies at age 95.” Local Broadcast Video Content. Oct. 9, 2012. Available through Academic Onefile. Web. Retrieved Jan. 17, 2019. Khan, Ansar. 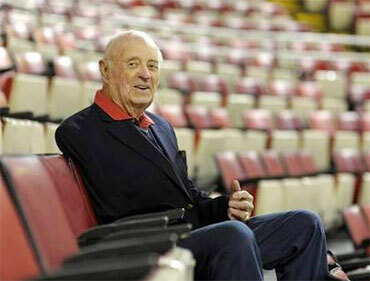 “Red Wings mourn passing of legendary announcer Budd Lynch, who spent 63 years with club.” Mlive.com. Oct. 9, 2012. Web. Retrieved Jan. 17, 2019. Krupa, Gregg. “Budd Lynch’s graceful presence will be missed at Wings’ home opener.”The Detroit News. Jan. 22, 2013. Web. Retrieved Jan. 17, 2019.